The Eyes of the Heart: A Memoir of the Lost and Found. San Francisco : Harper Collins, 1999. First edition of this powerful memoir. Octavo, original half cloth. Signed by the author on the title page, “Frederick Buechner Dec. 2009.” Near fine in a fine dust jacket. Jacket design by Laura Beers. 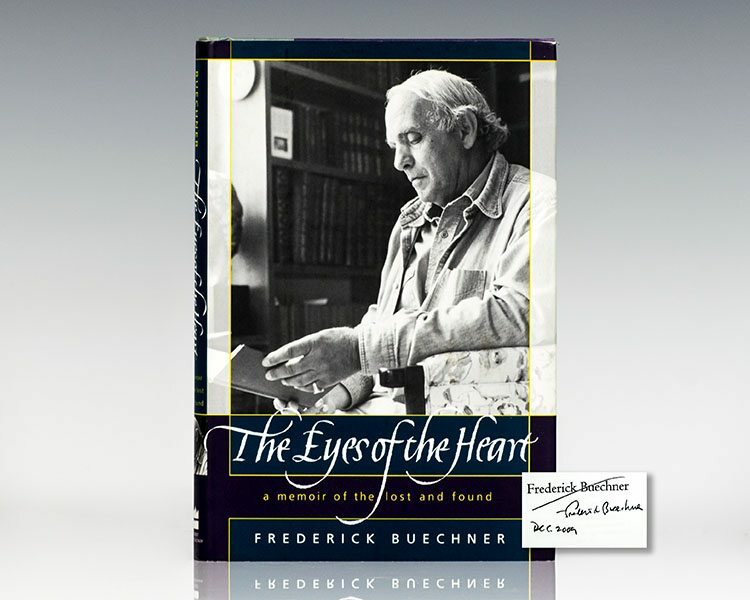 As "one of our finest writers," according to author Annie Dillard, Frederick Buechner provides yet another chapter in the tale of his life in this gripping memoir tracing the complicated roots and path of his inner life and family, with their multitude of intersections." The Eyes of the Heart stands as a touching testimonial to the significance of kinship to the author as well as to the legions of readers who have come to regard him as one of their own. New York: Seabury Press, 1970. First edition of this work by the author of A Long Day’s Dying. Octavo, original half cloth. Presentation copy, inscribed by the author on the front free endpaper, “For Luette Eaton with gratitude + esteem Frederick Buechner 8 July 1977.” Near fine in very good dust jacket with brown spotting to the extremities. Jacket design by Ronald Clyne. The Return of Ansel Gibbs. New York: Alfred A. Knopf, 1957. First edition of Buechner’s third book. Octavo, original cloth. Presentation copy, lengthily inscribed by the author on the front free endpaper, “This is full of real people…Dr. Kuykendall was based on my great Old Testament professor at Union Seminary James Milenburg. Ansel Gibbs himself was an amalgam of my old Lawrenceville headmaster, Allen Heely, and my cousin Lewis Duplas, who was the U.S. Ambassador to England, and so the name “Ansel Gibbs” I invented. Some five or more years afterwards, a boat sunk in the Boston Harbor during the War of 1812 was salvaged. Her name was “the Ansel Gibbs” – for Christopher Patrick, Celia and Greg Ross with blessings. Frederick Buechner.” Near fine in a near fine dust jacket. Jacket photograph by Elliot Erwitt. Rare and desirable with such a lengthy inscription by Buechner relaying the origins of this popular early novel.
. First edition of Buechner’s third autobiography. Octavo, original cloth. Signed by Frederick Buechner on the title page. Fine in a fine dust jacket. San Francisco: Harper & Row, Publishers, 1983. First edition of the author’s second memoir. Octavo, original half cloth. Signed by Frederick Buechner on the title page. Fine in a near fine dust jacket. Jacket design by Catherine Flanders. Book of Bebb Quartet: Lion Country, Open Heart, Love Feast, Treasure Hunt. First editions of each novel in the author’s acclaimed Book of Bebb quartet. Octavo, 4 volumes, original cloth. Each book is inscribed and dated by the author. Each are in excellent condition in dust jackets that show only light wear. A very sharp set. New York: Alfred A. Knopf, 1950. First edition of Buechner’s brilliant first novel. Octavo, original cloth. Presentation copy, inscribed by the author with a full page inscription on the front free endpaper, “I was only a few years older than Patrick when I wrote this. Whenever I glance at it, I am embarrassed. The fact that for many people it remains my best known book embarrasses me still more. Nonetheless, I inscribe it with all the best wishes. For Patrick, Christopher, Celia, and Greg Ross. 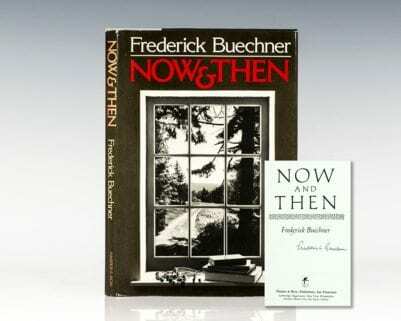 – Frederick Buechner August 1987.” Laid in is a postcard in Buechner’s hand addressed to Greg Ross, “29. vii. 89 Dear Mr. Ross, I share your horror and would be happy to sign the ancient volume. Best wishes, Frederick Buechner.” Near fine in a near fine dust jacket. Rare and desirable with such a lengthy inscription by Buechner. The Book of Bebb: Lion Country, Open Heart, Love Feast, Treasure Hunt. First edition of the compilation of the four books that make up the Bebb Quartet. Octavo, original cloth. Association copy, inscribed by the author to his Aunt and Uncle, “For Aunt Betty, Uncle Jim – a quadruple _____ from Leo Bebb- with love Freddy.” An excellent example in a near fine dust jacket with a small closed tear to the front panel. New York: Alfred A. Knopf, 1952. 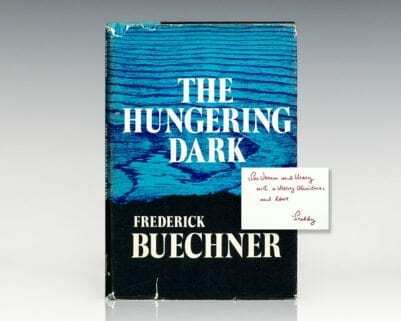 First edition of Frederick Buechner’s second novel. Octavo, original cloth. Presentation copy, with a full page inscription by the author on the front free endpaper, “This was the most insincere of all of my books. Following hard on the heels of my most successful. I wrote a good deal of it in the small village of Great Milton, near Oxford, where I would get so cold that I would have to get into bed to write, and then I’d fall asleep instead. With all best wishes to Patrick, Christopher, Celia, and Greg Ross. -Frederick Buechner.” Near fine in a near fine dust jacket. Photograph by Elliott Erwitt. New York: Simon and Schuster, 1974. First edition of this work on the life of Jesus. Octavo, original cloth, pictorial endpapers, illustrated throughout. Signed by Frederick Buechner on the title page. Fine in a near fine dust jacket. Photography by Lee Boltin. Design by Ray Ripper. New York: The Seabury Press, 1969. First edition of this collection of reflections on biblical themes. Octavo, original half cloth. Presentation copy, inscribed by the author on the dedication page, “For Vernon and Mary with a Merry Christmas and Love Freddy.” Fine in a very good dust jacket. Jacket design by Walter Ferro. New York: Harper & Brothers Publishers, 1937. First edition of Eleanor Roosevelt’s first autobiography. Octavo, original cloth, illustrated. Signed by Eleanor Roosevelt on the half-title page. Small bookplate to the front pastedown, near fine in a bright near fine with a few small closed tears. Uncommon in this condition and signed. David Ben-Gurion Memoirs Volumes 1-4. Tel Aviv: Am Oved Publishers, 1973-74. First editions of volumes 1-4 of David Ben-Gurion’s memoirs in Hebrew. Octavo, 4 volumes, original cloth. Volumes 1-3 signed by David Ben-Gurion on the title page in Hebrew. Ben-Gurion lived to see the publishing of only the first three volumes. Previous owners small stamp and pen writing on front free endpapers, tape residue on the front and rear endpapers. An exceptional set, most rare and desirable signed by the founding father and the first Prime Minister of Israel. First edition in English of Enzo Ferrari’s autobiography. Octavo, original cloth, illustrated. Signed by Enzo Ferrari on the title page. Fine in near fine dust jacket. Foreword by Stirling Moss. Books signed by Ferrari are rare.